An interview from the 2018 International Broadcasting Convention in Amsterdam with Patrick Palmer of Adobe. Adobe Systems is a computer software company which has historically focused upon the creation of multimedia and creativity software products, such as Creative Cloud which gives you all of the Adobe video tools, along with industry-leading design, web, and photography apps. In this interview Patrick talks with us about the next major releases of Adobe's Video and Audio Tools, including new features and enhancements that accelerate motion graphics workflows, audio cleanup, color grading, character animation, 180° VR, and overall performance across applications. At IBC 2018 Adobe unveiled new video features coming to Adobe Creative Cloud that will speed up production timelines, enable more seamless workflows and deliver powerful capabilities to bring filmmakers’ and video professionals’ creative visions to life. The updates include Adobe Sensei-powered animation, intelligent audio cleanup tools, selective color grading, advanced data-driven motion graphics templates and end-to-end VR 180° support. Motion Graphics templates provide a comprehensive toolset for creating and managing imagery and brand identity in video content, combining polished graphics with efficient customization in editorial. New authoring tools in After Effects streamline production in Premiere Pro with parameter grouping to organize the template and order the workflow for editors. Data-driven infographics turn numbers into stories in Premiere Pro. Drag and drop spreadsheet files onto Motion Graphics templates to generate visual representations of your information. Even better: updates to the spreadsheet are reflected automatically in the graphic. Instantly improve your audio by removing background noise or reverb with new Reduce Noise and Reduce Reverb sliders in the Essential Sound panel. Adaptive algorithms apply real-time adjustments based on the specific characteristics of sound clips. Work fast and keep it simple using the DeReverb and DeNoise sliders in the Essential Sound panel or choose them in the Effects rack for even more power and control. 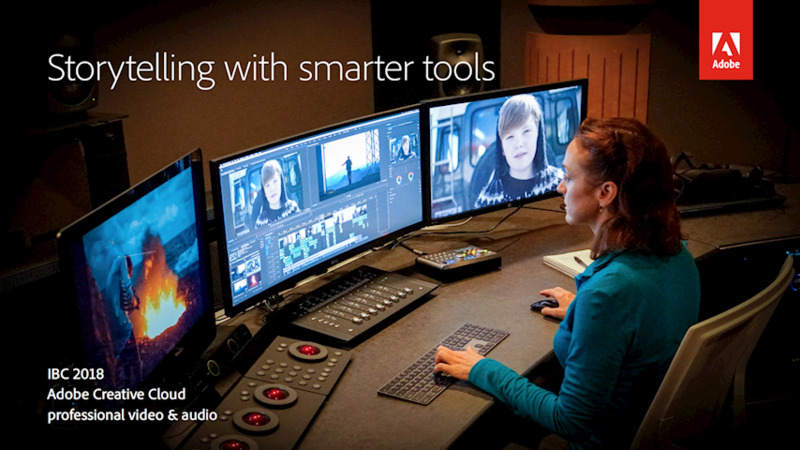 New Selective Color Grading tools in Premiere Pro and After Effects take the guesswork out of curve adjustments. Expanding on the Hue Saturation “donut,” Selective Color Grading offers more tools with greater precision by pairing values, such as Hue vs Hue and Luma vs Saturation, on two axes that show you exactly how much you can adjust any parameter as you work. Hardware-based encoding and decoding for H.264 and HEVC offer better performance and faster rendering. Improved image processing provides more responsive playback, rendering, and Lumetri Color performance. New native format support now includes ARRI Alexa LF (Large Format), Sony Venice v2, and the HEIF (HEIC) capture format used by iPhone 8 and iPhone X. Improved visibility for QuickTime 32 files makes it easier to identify legacy media in your projects. Motion Graphics Templates encapsulate complex After Effects projects into single files with simplified controls for use in Premiere Pro. Workflows like this, including Dynamic Link integrations, eliminate any need for intermediate rendering between applications, speed up production and keep your media editable at any stage of the pipeline. Simplified authoring: Designed to streamline editorial in Premiere Pro, After Effects artists can now hand off uncluttered Motion Graphics templates with editable parameters organized into groups with custom headings and twirl-downs for showing (or hiding) each set of controls. Your editors will love you. Font controls: Unlock font settings and enable editors to change typefaces without having to ask you to resubmit the template. Like everything else in Motion Graphics templates, you decide which elements can be customized and which should not. Responsive Design—Time: Preserve the integrity of keyframes within flexible, stretchable After Effects compositions to protect designated regions, such as intros or outs. Build stories in sound within a rich, responsive multitrack environment with all the tools you need for recording and mixing audio projects of any kind, including video, broadcast, or podcast content. Playback 128 tracks; record 32 tracks - all at low latencies with no drop-outs and no proprietary hardware required. First unveiled as Project Puppetron at an Adobe MAX sneak peek, Characterizer is now a production-ready component of Character Animator CC. Bring original art into Character Animator, record a series of words and facial expressions and Characterizer generates a new, unique character. Use slider controls to adjust the level of stylization and fine-tune regions and facial expressions to get the result you want. Your puppet is created in seconds. Use a webcam, or other connected camera to record performances, just as you would with any Character Animator puppet, and transform your own image into a work of animated art.